Glamping Lakeside this new could be became known by the public post soft restnya one of the restonya facilities right on 7 July 2016 ago. Still very new once, but see the attraction of tourism, this tourist attraction is predicted to be a new tourist destination that will be crowded to visit. 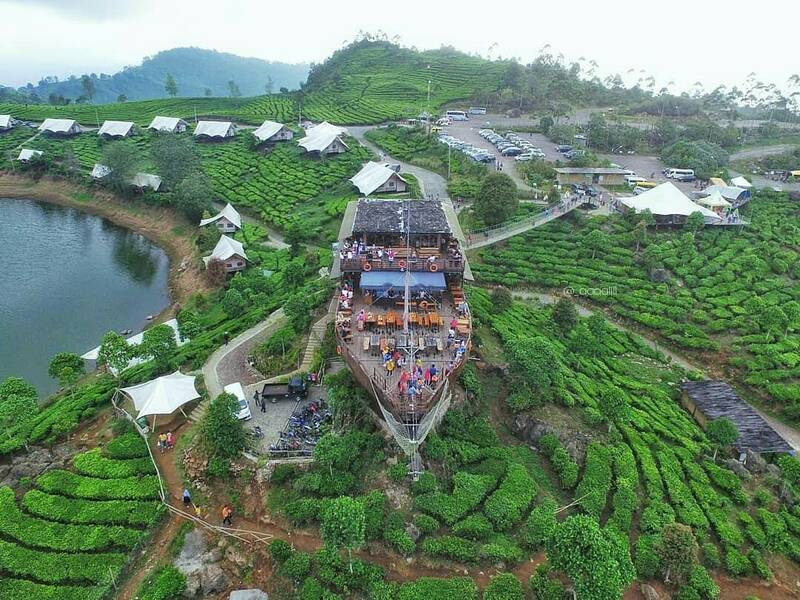 Glamping Lakeside Rancabali Ciwidey is said to be almost similar to one resort in the other south bandung Beru Ciwidey Valley Resort. And is one of Bandung Glamping in Ciwidey besides Glamping Legok Kondang. Friends of the traveler's lovers of Culinary Tour Bandung, you must once visit to one of the very unique dining places in this one bandung. Why is that? from the name alone you would already know, that the name of this restaurant is taken from one of our ancestral relic boat that is famous as a tough sailor, namely pinisi ship. Building Pinisi Resto in Glamping Lakeside Rancabali Ciwidey is divided into 2 parts area. The inside of Pinisi Restaurant is divided into 2 floors of restaurant. For the inside of the first floor is a place to order food with a closed area, while the second floor is its indoor and outdoor dining areas. The first floor outdoors Pinisi Resto which is located right on the bridge or deck, is a favorite location of visitors. From there we can taste various Culinary Menu Pinisi Resto while enjoying the beauty and natural atmosphere around Glamping Lakeside Rancabali Ciwidey. About the food menu, Pinisi Resto provides a variety of menu options, ranging from Indonesian or western cuisine. Starting from culinary like fried rice, liwet rice, steak ala Suis Butcher, until spaghetti is also available. And the favoritee Menu dishes such as carp lake lake, flying gurame, grilled rice, complete liwet rice, toast and others. In addition there is a companion menu, among others bread and bananas that are not less delicious than those in Warunk Upnormal. For the drinks you must try here is bandrek, and you also need to know Pinisi Resto is one of the Place Coffee in Bandung is fun. Pinisi Resto is the best dining option in Bandung that offers no less culinary atmosphere like in Floating Market Lembang. Whether you are tourists from the city of bandung or jakarta (take the exit toll Kopo) please take your route through Kopo - Katapang - Soreang - Ciwidey - Rancabali - Situ Patenggang - Glamping Lakeside. For those of you who use public transport, you can depart from leuwipanjang terminal and ride the vehicle with the aim Ciwidey. From terminal ciwidey you can continue by riding a rural transport vehicle or can also ride ojeg. For long journey alone, as we know the path that you will pass, especially the road is famous for the density of the vehicle alias jammed.